There have been many famous TV and movie cats throughout the years. We’ve selected 15 of the most popular cats and famous kitties in entertainment. Check them out and see if you agree. Then be sure to check out the additional lists of famous TV and movie cats below—a great way to quiz and test the knowledge of your cat-loving friends! 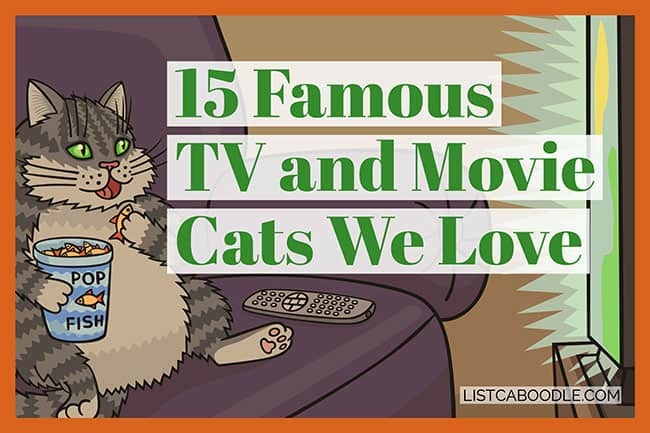 These are the 15 famous TV and movie cats we love most. You’ll recognize many titles and hopefully discover something new too. Grab some popcorn and enjoy! Two best friends, Milo the orange tabby and Otis the pug, romp and explore together in this amusing Japanese adventure film. The English-language version is narrated by Dudley Moore. The simple, yet enchanting tale of the two animals and their adventures is sure to be a favorite with children of any age. Born Free is the touching story of the orphaned lion cub Elsa. When she grows to young adulthood, Elsa’s owners are faced with the heart-wrenching decision to either set her free or place her in a zoo for the rest of her life. The film is inspirational to animal rights activists and animal lovers of all types. This live-action thriller features a troupe of adventerous animal friends, including Chance the bulldog, Shadow the Golden Retriever and Sassy the Himalayan cat. The friends, all voiced by famous actors, go on a cross-country, high-stakes adventure. In the end, they learn about the importance of family and home. It is a journey kids are sure to love! Disney’s epic animated musical The Lion King introduced us to Mufasa, Simba, Nala and Scar. Simba is heir to the throne and learns the circle of life from his father King Mufasa. The must-see, blockbuster film won two Academy Awards and a Golden Globe Award. Deep in the jungles of India, Bagheera the black panther discovers an orphan boy in a basket. The big cat serves as protector and friend to Mowgli, keeping him safe from the man-eating tiger Shere Khan. Several remakes and sequels have been made since the classic Disney animated feature film debuted in 1967. The infamous Pink Panther got his start in the opening sequence of the original (non-animated) Pink Panther film starring Peter Sellers. The lanky, pink cat appeared in the opening of almost every film in the long-running series and a Saturday morning cartoon series, The Pink Panther Show, was later developed. Henry Mancini composed the immediately recognizable “The Pink Panther Theme” for the character. Mr. Bigglesworth is Dr. Evil’s cat in Mike Myer’s Austin Powers movies. The long-haired tabby cat loses all his fur due to improperly thawing while escaping a cryonic capsule. The hairless cat is played by a Sphynx cat named Ted NudeGent. Mini Me, Dr. Evil’s diminutive clone, even has a kitten named Mini Mr. Bigglesworth. The TV sitcom featuring Melissa Joan Hart as Sabrina is based on the Archie Comics series of the same name. Sabrina’s cat Salem (Saberhagen) is a witch who was turned into a cat for attempting to take over the world. The animatronic cat delivers campy one-liners, adding to the light-hearted loopiness of the show. Two of Universal Picture’s biggest horror stars are featured in this dark thriller. Boris Karloff plays Hjalmar Poelzig, the satanic architect who carries a black cat around his house. Visiting psychiatrist Vitus Werdegast, played by Bela Lugosi, lashes out and kills the cat in fear. Church the cat is not the lovable family pet he once was after being reincarnated in the abandoned Native American burial ground. This classic Stephen King film is a cult favorite among horror movie buffs. A businessman on vacation is exposed to a mysterious gas while boating with his wife. As the months and days pass, he begins to shrink in size until he is small enough to fit inside a dollhouse. Butch the cat finds him to be an irresistable target. This rom-com features a witch (Kim Novak) who falls for her quirky neighbor (James Stewart). She uses her Siamese cat, Pyewacket, to cast a love spell on the man. Love ensues when the cat’s magic works all too well. Keanu the cat goes for a wild ride with Jordan Peele and Keegan-Michael Key in this hillarious action comedy. The cat is passed from one owner to the next, appearing in one scene as “New Jack” and wearing a do-rag. Later, Keanu appears in a drug-fueled dream sequence speaking in the voice of Keanu Reeves. You’ve seen them on YouTube and Instagram. They’ve taken over social media. They are the most famous cats on the internet! A surprising number of TV shows and movies feature cats and kittens. Cat lovers will surely recognize their favorite famous TV and movie cats from these titles, and hopefully discover something new as well!